In the New Tea Book, no leaf is left unturned. Discover the wide variety of teas that are available and their myriad health benefits, as well as over 50 recipes for cooking with tea: beverages, savories, and delectable sweets. Summary : This tea from Culinary Teas avoids the one potential problem you find in other chai teas...plenty of space, lack of flavor. And that's what I liked about this chai tea...it not only has spice, but flavor too. So if you like chai tea, the odds are you will like this one too. Review : I'm quite glad, actually, that Japan cut off the tea supply of the British during World War II. See, if they hadn't done so, the British would never have been forced to look "elsewhere" to satisfy their never-ending tea fixation. During World War II this fixation was filled by using tea from South Africa, called Rooibos Tea. True, rooibos tea isn't a "true tea," but well, in a pinch it is better than nothing...even for the traditional British! But in any event, I've really come to like rooibos tea. I love the color. I like the aroma. And I really like many of the other "things", or infusions if you like, that can be successfully added to rooibos tea. As such, it was with a happy heart that I discovered an overlooked sampler packet from Culinary Teas that was a Chai Rooibos Tea. Chai did you say? Yummy...as I love spicy teas! So what a perfect mix this could be! 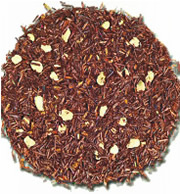 Here is what Culinary Teas says about this tea: "Rooibos with Chai spices, cinnamon, lemongrass, vanilla, and ginger. Makes a delicious decaf chai herbal tea." And indeed, this tea is a perfect blend of chai and rooibos. Even right out of the bag, a person who likes either rooibos or chai teas can't but help to be impressed, with the characteristic small size of rooibos tea leaves mixed in with other massive ingredients like lemongrass...all brought together by a very strong and delightful...and spicy...aroma. Once brewed, this tea will not disappoint...at least if you like chai or spicy teas. While this chai tea is NOT the spiciest of chai teas around, that is ok. To me, what counts, is the FLAVOR. And this chai rooibos tea has flavor in spades. Indeed, that is sort of why I enjoyed this tea so much...this particular chai tea is much more than boring old "black pepper," the main ingredient in many chai teas. The mixing in of cinnamon, vanilla, ginger and lemongrass all come together to produce a very taste...and still somewhat spicy...tea blend. Overall, if you like chai teas, you'll like this one. And...if you find too many chai teas taste like eating raw black pepper, well, give this tea a try. The taste of pepper is not nearly as strong as found in other chai teas. And this tea has a far better flavor than most other chai teas too! Recommendation : Yes. This tea is ideal for anyone who loves chai teas. It is also ideal for anyone who wants to try out a chai tea for the first time. And lastly, this tea is also perfect for the person who wants a "less spicy" chai tea...or, perhaps I should say, a chai tea that tastes less like pepper than many other chai teas do. Brewing Instructions : Use 1 teaspoon of leaves. Pour boiling water over the leaves. Let brew for 7 to 10 minutes. I let it brew for 8.5 minutes and had no complaints. Little Snowbird S'mores Plus Rooibos Tea : A replacement for a S'mores granola bar this tea is not, as the flavor is quite weak. Good Earth Red Lemon Rooibos Tea : A very enjoyable and rather unique lemon flavored rooibos tea. Republic of Tea Red Chai Rooibos Tea : A very tasty and rather spicy rooibos chai tea...which is also caffeine free, too. Rooibos Cocomint Tea from Adagio Teas : A perfect after-dinner tea with an great chocolate and mint taste.